It is my pleasure to announce that The Ansel Adams Gallery is once again sponsoring a special print sale of two of my photographs, offering a 25% discount off the normal price. 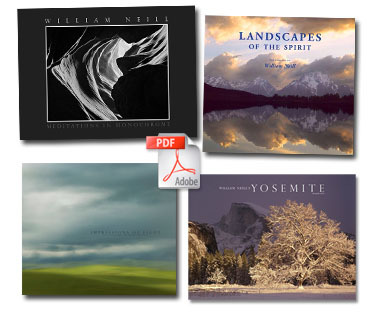 The two images we selected for this offer are Autumn Elm and Sunbeams, Cook’s Meadow, Yosemite National Park, California, and Autumn Sunset on El Capitan and the Merced River, Yosemite National Park, California. These two photographs have never been exhibited at a gallery or sold before. My signed, open edition 13×20 prints usually sell for $325, but during this sale, you can get one for only $243.75. Or you can purchase a 16×24 print, normally $450, for only $337.50. Most of my prints have been issued as limited-edition and are more expensive than the open-edition photographs. This is a rare chance to purchase one of my photographs at a reduced price, but the sale lasts for just six days until Sunday, September 18th at 6:00 PM Pacific time. 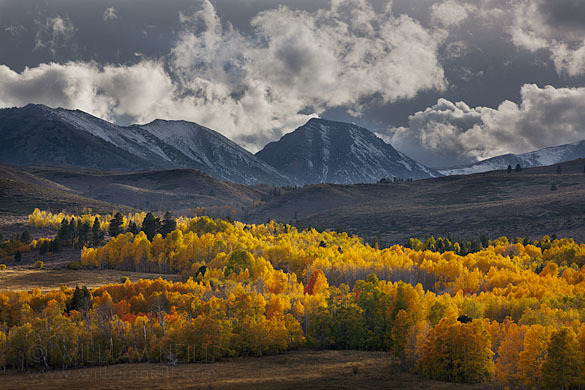 Please visit The Ansel Adams Gallery website to purchase a print or get more details. Making photographs is not only about the technical “capturing” of the image but also about the sensory experience with the landscape itself. Strong images can reconnect us with the experience and the people with whom we shared that time. Here are the stories behind the making of these two images. One October morning in 2014, I was teaching a private student in Cook’s Meadow at sunrise. 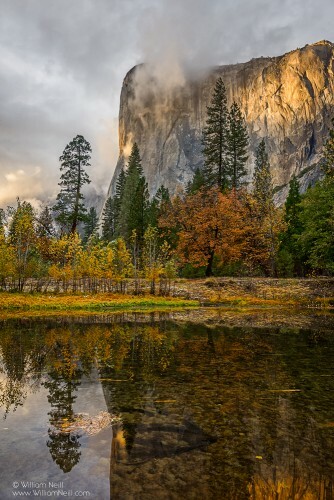 As a longtime Yosemite resident, I anticipated great photographic potential there. 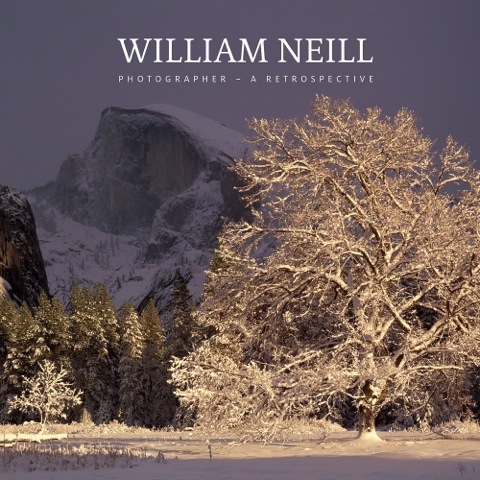 We started out photographing with a classic view of Half Dome, but as the sun first struck the damp meadow, we raced to where the sun was rising directly behind this extraordinary elm tree. 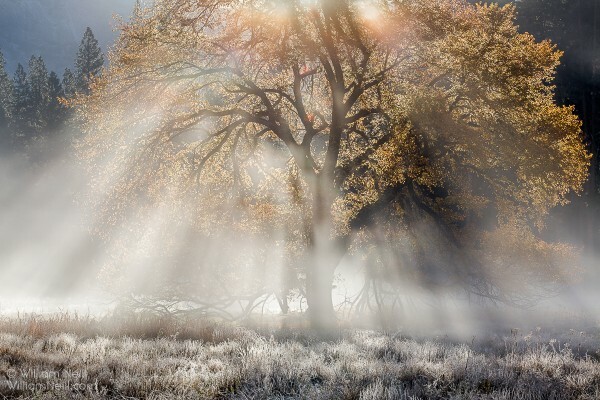 An amazing confluence of peak autumn color and morning mist unfolded before us, with sunbeams bursting through the graceful branches. Knowing that the mist would burn off soon, we worked rapidly to find a strong composition, shading our lenses from the sun using the tree’s limbs. As the sun rose higher, the beams shifted with the rising mist until they disappeared after only ten minutes. To me, this image captures a sense of hope, of “a new day shining out of the darkness.” This elm, which I’ve been photographing for 40 years, was once again a magical and wondrous sight. 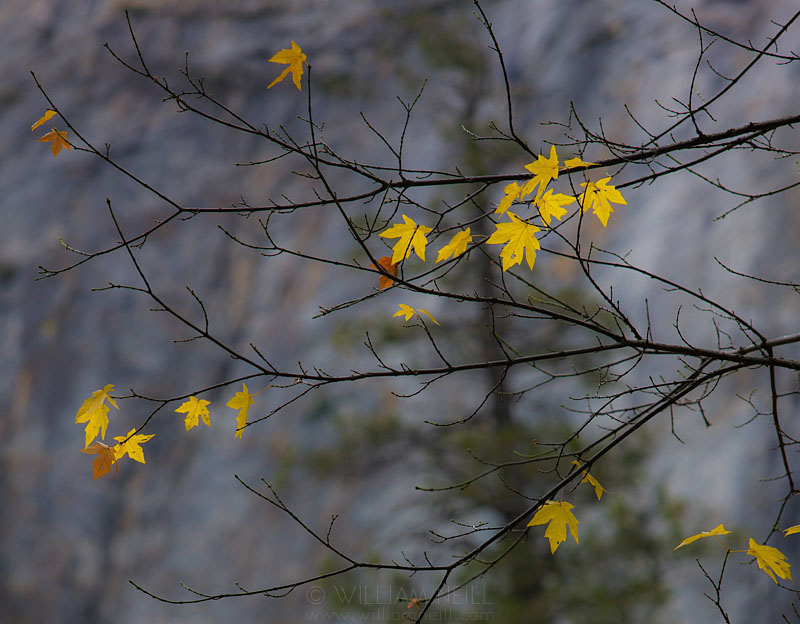 I have been photographing Yosemite and living in the area for nearly forty years. The wonders of this cathedral in stone never ceases to amaze me, especially during the changing seasons. The day I made this photograph began with pouring rain at dawn. 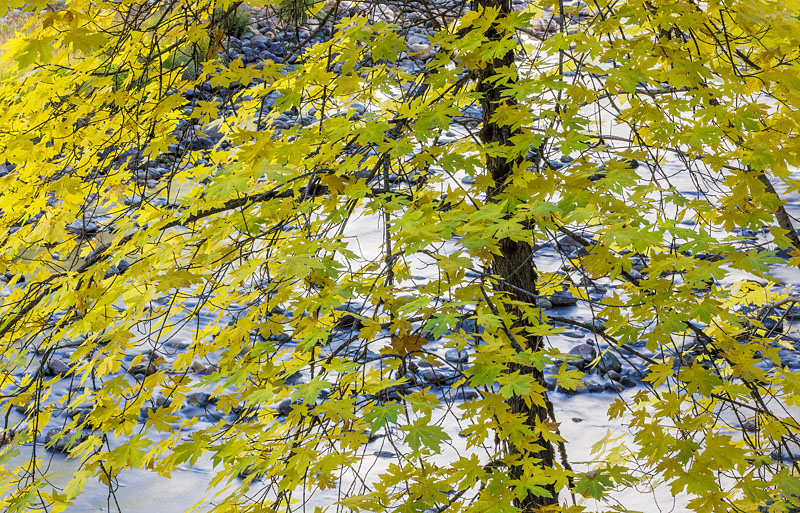 Then by mid-morning, it began to snow leaving a white dusting on red dogwood and golden oak leaves. By noon, the storm began to clear with clouds and mist ascending off of granite cliffs. After a thrilling day of chasing this extraordinary light and weather around the valley, I started for home. The clouds looked like they were closing in, how could any more epic conditions appear after so many blessings of the day? While driving past El Capitan, I noticed a small patch of light breaking through the clouds on its cliffs. 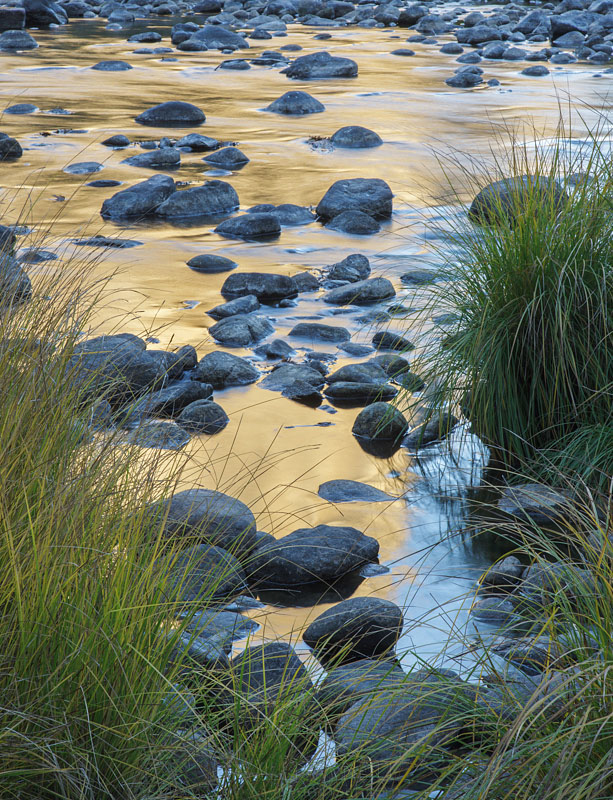 I raced down to set up my camera along the Merced River, finding these wonderful reflections and sunset colors. The incredible light lasted only a few minutes. After a day full of catching my breath in awe of such beauty, I finally, slowly exhaled with a peaceful sense of bliss. If you have any questions, contact me by email or post below in my blog. Please click here to purchase or for more information. 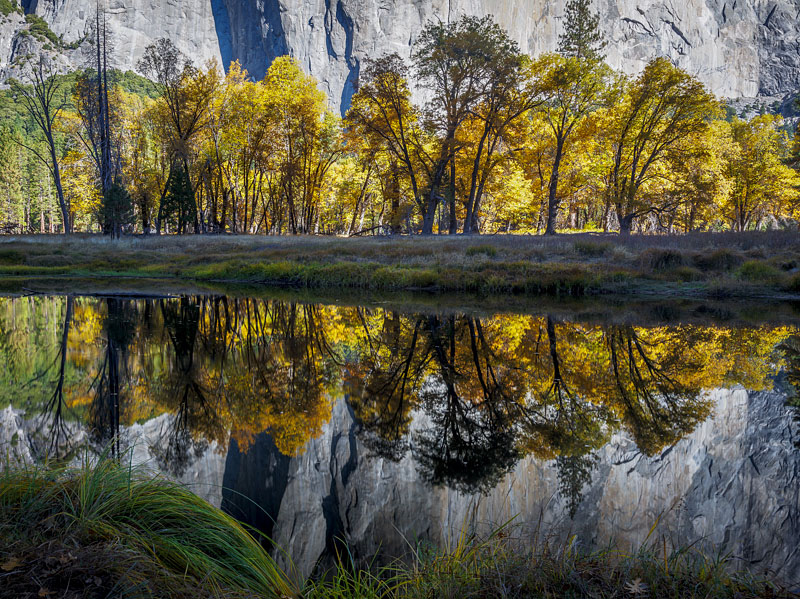 If you have dreamed of photographing Yosemite Valley during the best autumn color, now is time to reserve a private Yosemite workshop with me. I welcome single students, as well small groups for 1 or 2 day sessions. The dates for prime fall color run from the last two weeks of October, and the first week of November. 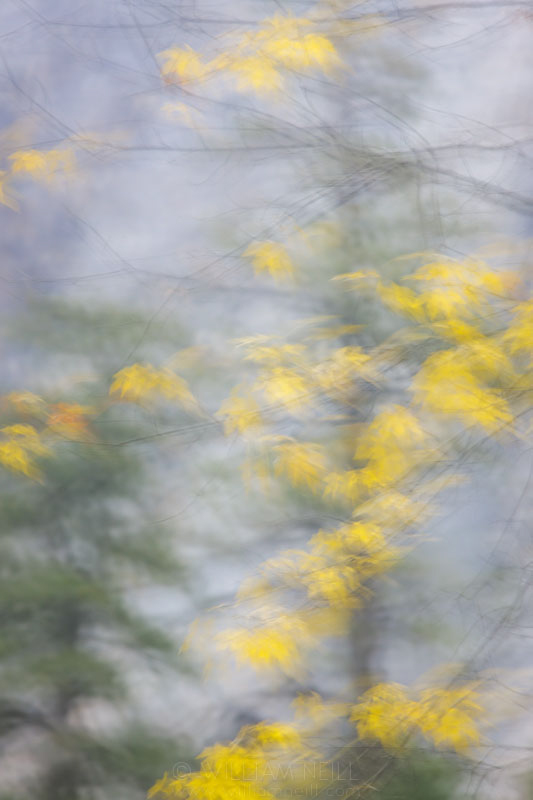 Below is a small collection of photographs made during last year’s autumn season. Enjoy and share! 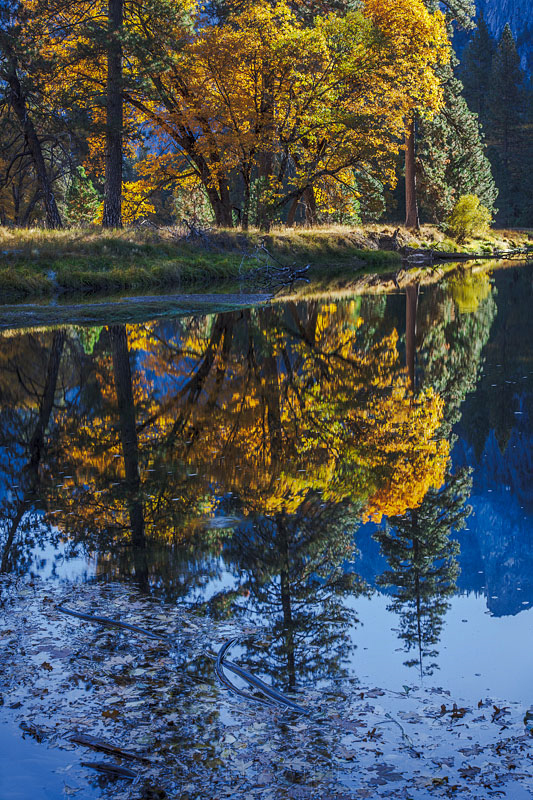 I hope to see you in Yosemite this fall! 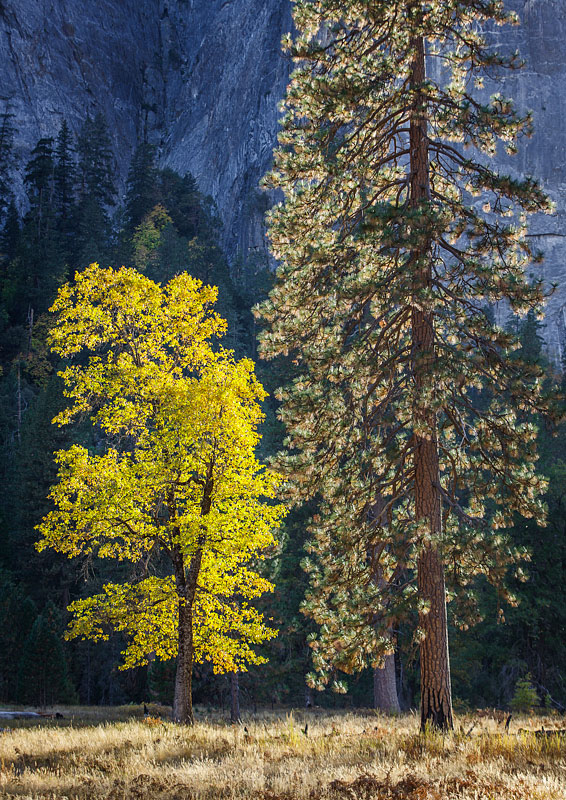 For the month of September, I am offering a new Special Edition “Mini” Print from my Yosemite portfolio. I am releasing one image at a time as a “Featured Print” which you will be able to purchase directly from me! 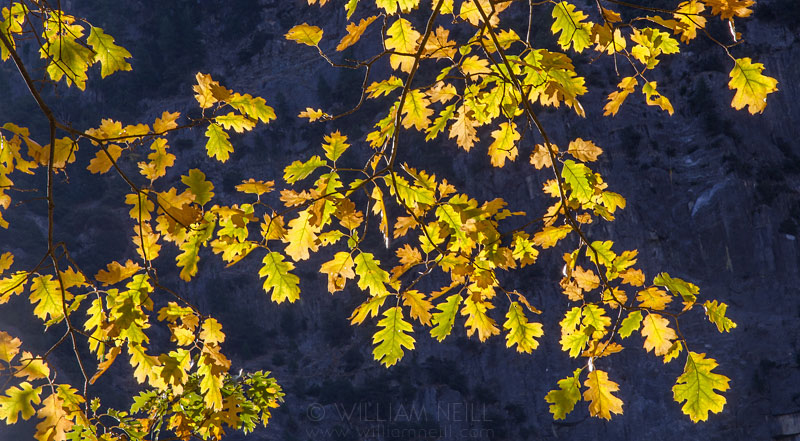 This month’s Featured Print is “Black Oaks, autumn, Yosemite National Park, California 1984″ shown to the right. This Special Edition image is an archival inkjet print, sized to 9″ x 7″ on Premium Satin Paper, matted and mounted to 11″x14” on archival museum board. The print will be initialed by me, not signed. The series will be unlimited in quantity, but numbered sequentially on the label. With each collectible Special Edition released, you can build a fine art portfolio of my photographs at a very reasonable cost. And the best part…it’s only $40! Click here to get your print!